Nikon Coolshot will offer you quick, accurate and fast measurements that will have a significant impact on your game. The primary benefit of these adjusted measurements is that you will be able to pick the right club for each shot. This is turn will help you win more games and improve your golfing experience. 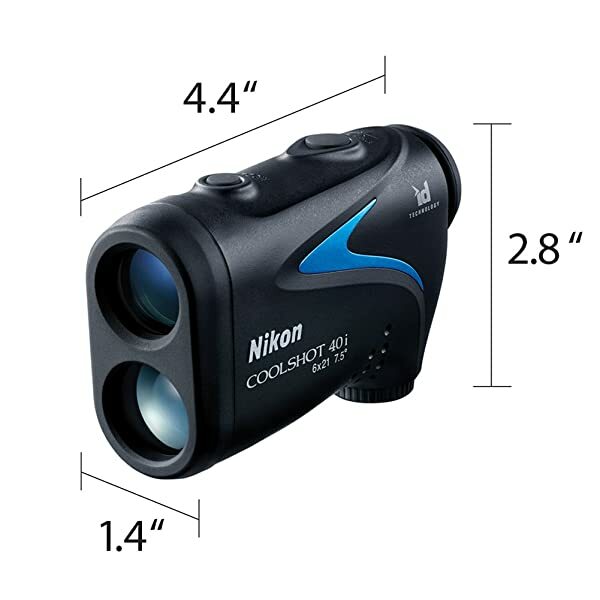 I have been using the Nikon Coolshot 40 Laser Rangefinder for some time and due to its compactness and its quality of service I have always thought that nothing could be better than it. However, this notion changed recently when I was introduced to the Nikon Coolshot 40i. I had been told by a few of my golfing buddies that it is one of the most powerful laser rangefinders, and so I had to try and I did not regret this. Although the Nikon Coolshot 40 served me perfectly well, the 40i took things to a whole new level thanks to its famous angle compensation technology. First Target Technology: This technology ensures that the rangefinder focuses on a single target for increased accuracy and efficiency. Height and Slope Adjustment: By using highly advanced ID (Incline/Decline) technology, Nikon Coolshot 40i adjusts the distance measurement to compensate for things like uphill or downhill slopes and angles. You will know how far you should hit the ball, so that you can pick the right club for each shot. Battery: Powered by a CR2 lithium battery that ensures a long-lasting dependability. Multiple Modes: This feature provides options for standard or slope adjusted ranging and first or distant targeting option. Long Eye Relief: Ensures easy view especially for golfers who have eye problems or wear glasses. Wide Temperature Tolerance: It can take any temperature between 7 and 122 degrees Fahrenheit. Ranging Capability: Has a ranging capability of 8-650 yards at an accuracy of +/- two and a quarter feet. 8 Second Continuous Measurement: This feature allows for quick scanning and measurement of distance to specific target. To use this feature your only need to push and release the power button. Hyper Read: Provides measurement response in half a second regardless of the distance being measured. Rainproof: Comes with a rainproof casing to keep rain water out and hence ensuring you can use it in wet conditions. Nikon Coolshot will offer you quick, accurate and fast measurements that will have a significant impact on your game. The primary benefit of these adjusted measurements is that you will be able to pick the right club for each shot. This is turn will help you win more games and improve your golfing experience. Overall, the ID Technology that automatically adjusts for the slope of the course is what will benefit your game the most. A distance measurement can be off by many yards if it is not adjusted for slope and so the ID technology will make the measurements more accurate. The broad temperature tolerance and rainproof casing helps to ensure that you can use the rangefinder in very severe weather conditions. 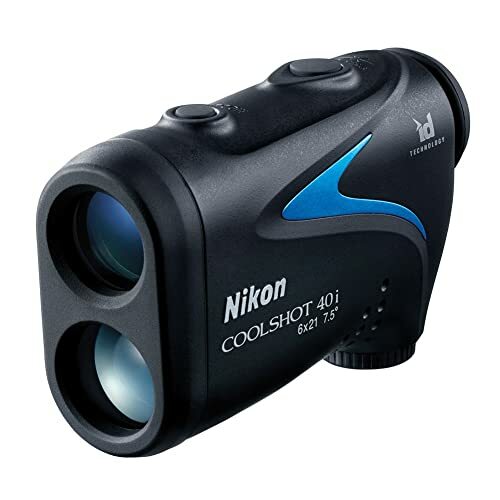 Nikon Coolshot 40i is very light and has an ergonomic compact design that make it very comfortable to walk around with during a game. Has long battery life thanks to the rechargeable CR2 lithium battery. It also has an Auto Power Function that automatically shuts it down when not in use to conserve power. Despite its many features, the Nikon Coolshot 40i is extremely easy to use and handle. There are only a couple of buttons for all the operations, and so you will have little to no trouble figuring it out. Due to its power and capabilities this rangefinder is not allowed in many golf tournaments. This is a significant setback for many players but it may change soon. 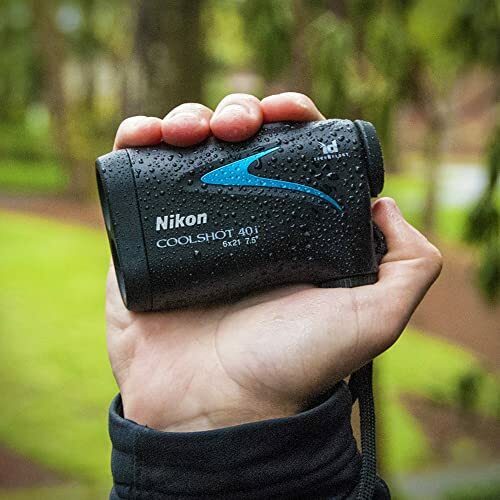 The Nikon Coolshot 40i Golf Laser Rangefinder is the most flexible and practical device in the Nikon line. Add this to the fact that it is almost flawless any you have yourself the perfect rangefinder for your next golf outing. However, you should remember that the slope assistance feature makes it a prohibited device in most tournaments. The bottom line is that it is a perfect tool that every golfer should own.